This resort in Clark Philippines also offers certain corporate learning products in and around the Pampanga area. Facilitators will conduct the seminar/workshop in Clearwater Resort aimed at enabling businesses to save on money and maximize their participants to the training program. Clark Philippines gets much needed high-quality venue for company outings, seminars, team building and company or private events. In difficult times, budget is tight for company outings, team-building and seminars. Even planners avoid overnight trips out of Manila and organize day-tours to good teambuilding venues near Manila instead. Philippines Clark Zone is just 90 minutes from Manila. Clark Pampanga has a great day-tour venue called Clearwater Resort and Country Club located in the central business district of Pampanga Clark Freeport Zone. Please click here to contact Clearwater Resort for details. Site visit to this hotel in Clark Pampanga can be arranged with advanced notice. Experienced event organizers place safety, law and order and privacy as the most important criteria for selecting a suitable event venue for team building near Manila. They realize that unpleasant incidences can ruin the entire teambuilding event causing anxiety among participants and taking all the fun away from a summer outing outside Manila. Manila and Pampanga event planners are no longer attracted to cheap package trips that promise much more than the resort or hotel can actually deliver. These packages invariably result in disappointments and complaints from the participants attending these company outings outside Manila. 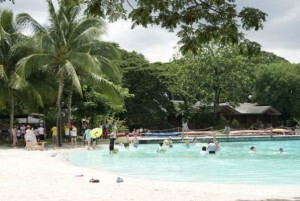 Proximity of the teambuilding venue near Manila is also an important consideration. The short 60-minute journey from Metro Manila to Clark means a lot to day-trip excursions. The extra 2 to 3 hours of time saved from the shorter journey to and from the teambuilding venue destination in Pampanga means more time to enjoy the facilities. Participants arrive fresh and ready for action instead of feeling exhausted and worn out from a long and tedious journey.